Variations in Nodularity, a type of graphite structure that can develop during the production process, can attenuate the velocity of sound waves passing through the automotive component being tested. 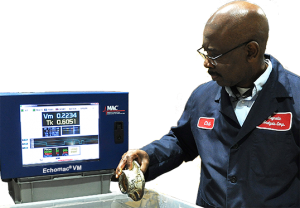 Echomac VM measures the sound velocity and, using known limits, reports whether the part is acceptable. Evaluations in less than 2 seconds. Enclosure includes a closed loop heat exchanger to ensure proper operating temperature and protection from the outside environment. Dual Screen view displays test results for two parts. Easy to read Velocity Application screen. Trend Chart display and built in Data Logger. Adapts for automatic or manual testing. 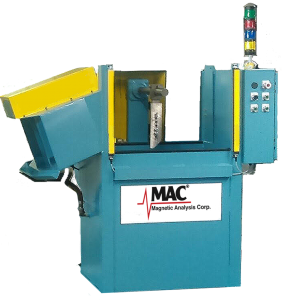 Also available is an Echomac® VM Test Tank system consisting of a heavy duty steel immersion tank, removable part fixture, automatic part ejection mechanism, air stamper for marking good parts, and full PLC control for managing the system and ensuring operator safety.